I was a little stunned, watching my teen make her way through the crowd, pushing Zoe. My soon to be high school girl, was doing what she is supposed to do, growing up and letting me know that she is ready for more. We spent a lot of time together during this summer of anticipation, forever marked by her transition into high school. These are just some of the things she taught me. I want you to expect more from me, and then remind me I can do it. High school teachers already know this truth, and that is why they come on so strong the first week of school, so parents, be prepared. Do our teens get overwhelmed? Sure, especially when everything is new and expectations are higher. Our teens are ready for more, but that doesn’t mean they have the confidence to match. Create opportunities to build trust, pointing out small successes whenever possible. I need to stay socially connected, so don’t take my devices away, help me manage them instead. Big things are happening in the world, and I still need to talk about them. Most teens today get their news, both current events, and pop culture, through digital social media streams. We always watch the news together, but most breaking news my daughter sees first online and often when she is alone. 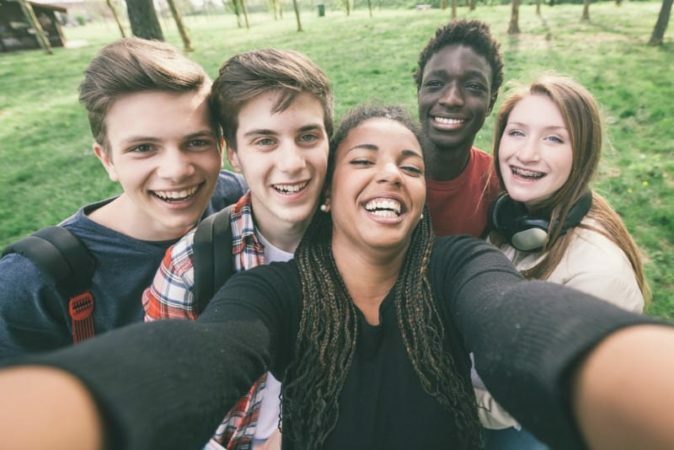 It’s important to discuss the big topics-especially the most significant, most powerful, sensitive and provocative issues in person, to make sure teens have a real sense of understanding and that you have addressed any concerns that may be troubling to them. I still want to hang out with my family sometimes, even if I don’t act like it. Just because your teen looks comfy just hanging out in her room, doesn’t mean she wants to be alone. In fact, it gets lonely. Once you get past the initial protests, laughter and good family fun will follow. Eventually, the resistance fades. Your hugs and your touch can still make me feel better. Let’s face it, life is busy, sometimes family schedules can conflict and so much communication today takes place via technology. Our teens are walking around in these adult bodies, and sometimes we forget that they are still forging their way, trying to figure out how to de-stress and carry on conversations IRL. Teens are often touch deprived. When was the last time you hugged your teen, hung out on the couch sitting together or even held hands? Start slow, reintroducing affection to your daily routine, it is one of the fastest ways to reduce stress and boost both physical and emotional health. Finally, expect tears. It won’t be just your teen that is overwhelmed with the high school transition and navigating new opportunities for independence. Because as parents, we do all we can to prepare our kids for adulthood, pushing them out into the world, when sometimes what we really want is to still keep them close, just a little longer. Suzanne Perryman is the mom of two teen girls. She lives in Scottsdale, Arizona where she celebrates the everyday on her website, Special Needs Mom. Her work has been featured at NBC Today Parents, Huffington Post Live, Brain,Child, Scary Mommy, The Mighty and various parenting platforms, anthologies and print publications. You can find her on Facebook and on Twitter.